Map It! Okinawa: "The Naha Tug-of-War"
Read, Set, Go! Spectators rushing to get near the rope. UPDATE: Due to the recent typhoon, the Naha Tug-of-War Festival has been postponed to SUNDAY, OCTOBER 19th. The Hatagashira Parade 1130-1400 Kokusai Street. Tug-of-War 1430-1700 Kumoji Crossing. RBC's Citizen Festival CANCELLED. 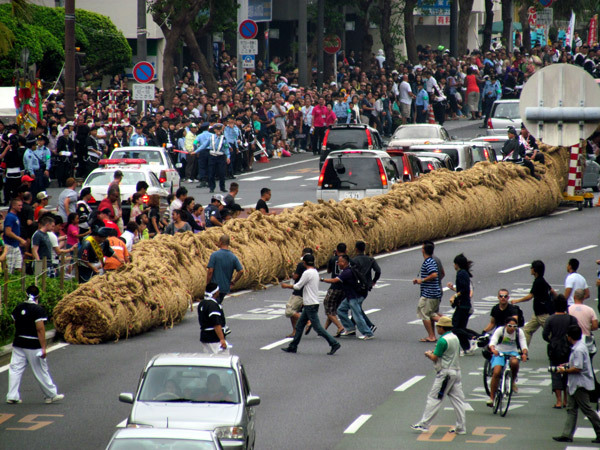 Every year in October, thousands of people flood to the streets of Naha City to see the annual Naha Tug-of-War (Naha O-tsunahiki). This is the 'mother' of all tug-of-wars held throughout Okinawa. The tug-of-war (tsunahiki) is a common event that happens in many small villages throughout Okinawa to help promote prosperity, but the annual Naha Tug-of-War has one 'big' distinction. It holds the Guinness World Record for the largest rope made by 'rice straw'. It was first recognized in 1995 with the rope weighing just over 31 metric tons (31 tons 730kg) at a length of 172m, and a rope diameter of 1m 54 cm. It was renewed for the 3rd time in 1997, with new record weighing in at 40 metric tons & 220kg at a length of 186 meters with a rope diameter 1m 58cm, and an estimated attendance of 275,000 people. Early History. 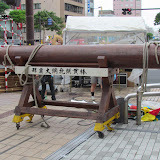 According to the Office of Conservation Society of the Naha Giant Tug of War, Naha at one time consisted of four towns (Nishi-Machi, Higashi-Machi, Wakasa-Machi, and Izumizaki) and they were simply divided into two sections, East and West, and thus the tug-of-war has become an East versus West kind of rivalry. The tug-of-war event was only held for special occasions of celebration before it started to become an annual event beginning in 1971. The first annual Naha Tug-of-War was held to commemorate Naha's 50th Anniversary as a municipal government. Since its debut, the number of towns have grown, and the grand event is now held on a Sunday before the second Monday of October (the second Monday being Health and Sports Day). Today. The event is actually a three day spectacle with the first day (Saturday) consisting of fork art performances along Kokusai Street (Kokusai Dori). The second day is the Parade of Flags (Ufunnasunei), also along Kokusai Street, which then leads up to the Naha Tug-of-War at Kumoji Crossing (along Highway 58), and the final day (Monday) is the Naha Tug-of-War Festival which occurs at Onoyama Park. Saturday – Folk Art Performances, 1430-1830 . Location Kokusai Street. Sunday – Parade of Flags, 1130-1400. Location Kokusai Street. The Giant Naha Tug-of-War, 1430-1700. Location. Kumoji Crossing. (The actually pulling of the rope is 30 Minutes, starting about 1630). Sat, Sun, Mon – Naha Tug-of-War Festival, 1100-2030. Location Onoyama Park. Location. GPS coordinates above is the location the actual tug of war event. (Kumoji Crossing in Naha along Highway 58). Recommendations. Because the actually tug-of-war event draws a large crowd, recommend getting their early to find parking and to position yourself early for viewing. Traffic along Highway 58 (at Kumoji Crossing) halts at around 1400. Recommend taking your pictures of the rope before 1400. Once they allow people near the rope (around 1430), the rope will not be visible at all.